London, 2123. A century after ebola-bombs decimated the population, PC Sean Weaver of the Combined Police Force is a drone operative tasked with enforcing the Government’s dictatorial rule. Nearly anything and everything is considered Subversive and the people huddle behind ever-watched walls, under threat of forced labour on The Farms for the smallest infraction. Trust is nearly impossible to come by and terrorists could be anywhere. Trapped within this oppressive regime, Sean has to make do with small, secretive acts of rebellion lest he end up on The Farms himself. Until, that is, the day he witnesses the mass murder of hundreds of civilians. Events quickly spiral out of control, propelling him into a bloody and brutal conflict where he finds himself faced with the ultimate choice. Accept his fate and bury the truth, or fight back and become… Subversive. I reviewed Grzegorzek’s apocalyptic adventure Flare – see my review here – which I thoroughly enjoyed. But this sci fic dystopian thriller hits the ground running and the pace doesn’t ease up until the climactic ending. Sean is one of the novel’s strength’s – he is a likeable chap who can certainly handle himself in a scrap and quite right, too, as he is a trained PC. However, while he is at the heart of all the action and manages to attract trouble like a magnet attracts iron filings, Grzegorzek manages to avoid his depiction of Sean becoming too invincible. While he is horrified at the wanton slaughter of fellow Londoners and wants to do the right thing, he is also reluctant to risk his own family or endure too much physical pain. In other words, he is just like you and me – which made me warm to him and care about what happens to him. The other outstanding aspect of this book is the twisting plot, which kicks off when Sean sees something he shouldn’t. Immediately, he finds himself hauled into the middle of a plot to wipe out the terrorists who are held responsible for the incident and I settled into the book, thinking I knew how it was all going to play out – only to find within the next handful of pages, it all flips around and something else is going on. The speed at which Sean experiences reverses and finds himself in the middle of desperate situations reminded me of Darrow’s struggles in Pierce Brown’s Red Rising series. Grzegorzek’s depiction of a ravaged London, particularly the grim state of the underground stations, are memorable and provide a suitable backdrop for the desperate battles that are played out. The technology is believable and I was also pleased at Grzegorzek’s explanation of why a fair proportion of the population are now behaving like mindless sheep and showing slavish obedience to a corrupt and unpleasant form of government. All in all, this was a cracking read – and as the first book of 2018, I was delighted it was such an entertaining book. Recommended for fans of dystopian and post-apocalyptic thrillers. I LOVE twists and turns and having my assumptions turned upside down! Sounds like this book certainly does this. This was a fine review, BTW. Thank you, Rae, I’m so glad you enjoyed the review. Yes – I, too, love having my assumptions turned upside down! p.s. What is the Blog-hopping challenge? 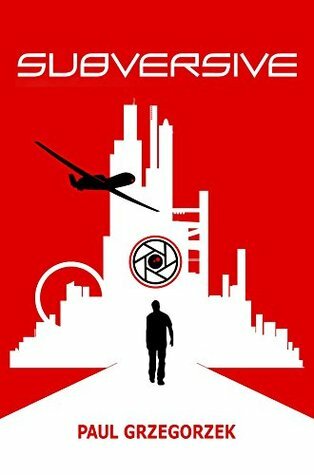 Post-apocalyptic scenarios are one of my favorite themes, but it’s hard sometimes to find a story that feels truly innovative: this one has all the marks of being an outstanding read, one that matches speculative elements and deep questions about truth, honesty and what it means to be human. This sounds like a book I would enjoy – I will go and check this one out. Sounds like your 2018 reads started much better than mine. 🙂 The book sounds interesting, and I’ll keep it in mind for when my TBR pile is slightly smaller. Thank you!